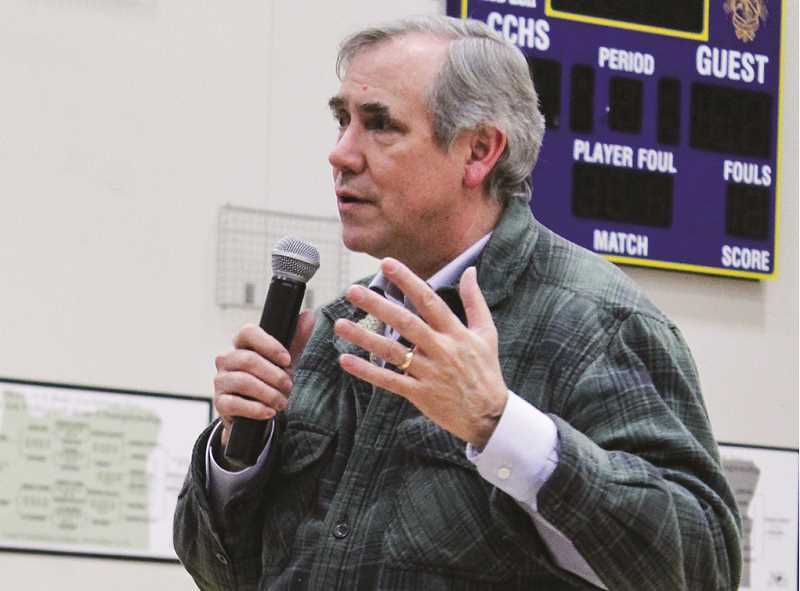 About 150 people filed into the Crook County High School gym Friday evening as U.S. Sen. Jeff Merkley completed a three-day stand of town hall forums across the state. As he does with each annual visit to Prineville, Merkley kicked off the event by gifting an American flag flown over the U.S. Capitol to a local organization. This time, the chosen recipients were the Friends of the Crook County Library. Before launching into a question-and-answer session that spanned most of the hour-long forum, Merkley, a Democrat, highlighted three concerns he is hoping to address back in Washington. The first of these was what he terms "the corruption of our constitutional process," clarifying specifically that he wants to take on gerrymandering, voter intimidation and dark money in the election process. "These instruments are really changing 'We the People' government," he remarked. The senator went on to express his concerns about the "failure to do enough investment in the foundations for families to thrive." He said these foundations include affordable housing, the stressful health care system, living-wage jobs and education. Finally, Merkley expressed his concerns about carbon pollution and its impact on such things as forests, farming and fisheries. He stressed that Oregon is facing longer, fiercer wildfire seasons, warmer winters and a smaller snowpack. "We have to change this, and we have to celebrate the transition to 100 percent renewable energy," he said. Some topics he raised, such as wildfires, would later emerge during the questions asked by audience members. Pressed about what should be done to reduce the escalating wildfire problems, Merkley said he wants to promote forest stewardships and collaboratives that bring timber and environmental communities together. In addition, Merkley expressed support for prescriptions to the thin the forests. "The President symbolized this process by saying we need to rake our forests," he said. "Well, it's a little more complicated than raking, but the idea is you end up with saw logs, a healthier forest, jobs and more fire resistance, which is all positive." Regarding health care, Merkley went on to emphasize that the system is stressful for Americans and offered solutions he is hoping to see reach fruition. "I think we have to take a real look at what many nations do, which is have a simple, seamless universal health coverage that covers you just by virtue of living in the United States of America," he said. Merkley went on to say he has proposed a public option for Medicare. He pointed out that one exists for workers compensation, SAIF, and said it cut costs in half. "When you have a public competitor, it can be a very effective mechanism in dropping the price of health care," he said. The senator went on to target prescription drug price "gouging" as a problem, and he told the audience that he has brought forward the Low Cost Drug Act, which says a company cannot charge more than the average of what they charge in other countries. Audience members also questioned Social Security, asking what can be done to improve the system and ensure the money will be available for retirees. Merkley pointed out that currently there is a 20-year horizon on the Social Security trust fund, and he said he agrees with citizens who believe it is best to lift the cap on the income that's subject to premiums. "That can make it secure for a 70-year horizon," he said. Merkley went on to say that he disagrees with cutting Social Security, saying "as pensions disappear and jobs across the landscape of America, Social Security becomes even more important." Later in the forum, Merkley offered another form of retirement savings that he believes would provide people more money once they stop working. He proposes what he termed an automatic savings account that would be established during a person's first job and follow through their years of employment to retirement. "Three percent of your salary would be automatically invested in the type of account the federal workers have," he explained. "It is a range of investment opportunities. You could increase the percent or decrease the percent or opt out completely. … It would add up to a sizeable complement to Social Security by the time you retire." The topic of immigration was broached by audience members on more than one occasion. Merkley recounted his visits to the Mexican border and seeing immigrant families separated and kept in prison-style camps while awaiting asylum hearings. He stressed multiple times that those immigrants should be treated with respect and decency. "I look around this room and very few of us are here that don't have an immigrant history," he said. "We would not want our ancestors to have been treated as criminals for fleeing persecution abroad and coming to the borders of the United States of America." He went on to note that nearly all detained families ultimately attend their asylum hearings, and of those who do, 80 percent are sent home due to a lack of evidence that they were persecuted in their home country. "Whether they stay or whether they leave, let's use the Family Care Management program to treat them with respect and decency," he said. In closing, Merkley thanked the audience for taking time to show up for the town hall forums and stressed that meeting for such events and discussing complicated issues helps bring an increasingly polarized nation closer together. "Thank you all for coming out to share in this dialogue," he said.